Katie has returned from her vacation with her Grandmother in Maine. She showed me all her photos and many from Kim too. It looks like they had a great time touring from Bangor to Blue Hill to Acadia. It’s nice she is home. Over the past two years at work I’ve been involved with the same project. During that time my job has ranged from being a down and dirty coder to the project lead. All the development has been in the C language. The work has been split between a team in the US, and one in China. This split has been both a benefit and a source of frustration. Having a worldwide team of developers, whose 13-hour timezone difference allows almost constant development, has been good. However, this too has made it difficult to coordinate and synchronize the two teams. So about two months ago my management and I decided that we should transition the development from a split team to a single team located in China, and the US team doing other work. We felt this was best for the business. So I had to develop a transition plan and then execute it. In the next two weeks I will complete that task, and the project will no longer be mine. I have mixed feeling about what is happening since I have enjoyed the responsibility – preferring to be in control. However, I look forward to no more evening calls. To help make this easier on me I’ve started on a new project which I feel good about. This is fresh or clean-sheet development of a new specification. Although the interface is written in C I’ve chosen to use C++ internally. Returning to object-oriented programming has also boosted my spirits. I’ve been able to develop a set of abstract classes that represent the specification, and then implement them with set of concrete classes. So far I keep remembering Systemantics: “A complex system that works is invariably found to have evolved from a simple system that works.” And that’s what I’ve done, and although it’s really not a “system” I still feel that what I’ve done is a good thing. This past week we’ve been hearing about the storm named Ike. It’s coming. So people have been arriving in Austin from the coastal parts of Texas. Since I have my long run on Saturday morning I wondered if it would be canceled. Well I woke and looked out the door and it was clear and dry out. At the run we were told that it would start raining during the run. Nope, it didn’t happen. It was a bit cloudier out when we finished though. So far I’ve had my sister-in-law phone to ask if we’re OK. And there wasn’t much to say other than it is dry out and we’re OK. Then later my son sent me an e-mail asking if we were OK. 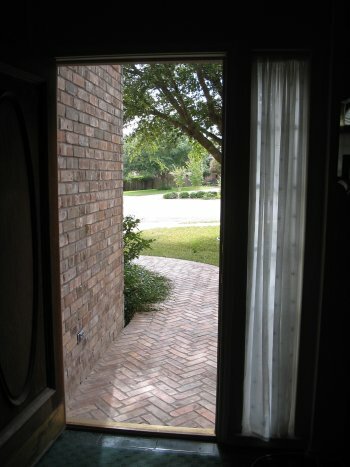 So I went to the front door and took this picture. Still sunny and warm out. So we’re OK here, and there is nothing to worry about. I got this new toy yesterday. 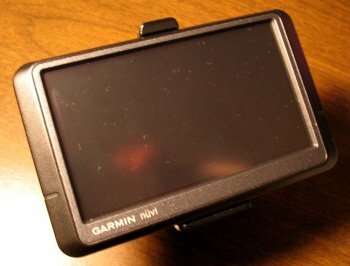 It’s a Garmin nuvi 255W GPS. I’ve wanted a GPS for a while. I had previously ordered one back in March before our recent cross country trip, but I canceled the order in late June just before the trip, because this model hadn’t been released by then. So after receiving it yesterday I decided to try it out. Kathy went with me. We selected the nearest gas station, a Shell. But there was no station there. This was not good. Next I selected an Exxon station, and it indeed directed me correctly to one around our block. Along the way I made a mistake and it recalculated the path correctly. But it does get confused if I drive through a parking lot, that is, not on a known street. After filling up my gas tank we selected our nearby HEB grocery store. This is our regular grocery store, which we are very familiar how to get there. It directed us almost to the store. But just before we got to the turn to go into the shopping center, it directed me to turn on the street before it. I think it was trying to direct me around the block to another entrance, but it was confusing. Let’s hope this is not a regular thing. A very old woman cups her hand and uses it to stroke each cheek of her grown children. Through her touch she shows the love in her heart for them. She feels the tingle of their presence, and they her’s. It gently expresses how glad she is that they’ve become such good people. She feels their warmth, their life, and their vitality. But most of all she does it to capture a sense memory knowing they will be leaving for their far away homes. Her touch is something physical that she can remember afterwards. Something she can recall in the following days. … Although I touch their images on the LCD screen trying futilely to do the same, feel the same, sense the same, yet the screen feels flat and cool, not warm and alive. And I cannot stop. 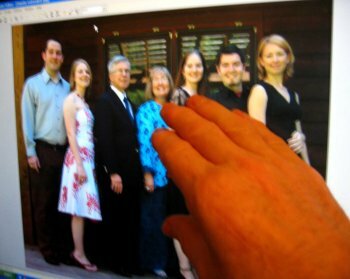 I have to glide my finger tips over their images, their faces. As I do I say “I love you”, and “I miss you so”. You are currently browsing the Watt's Up blog archives for September, 2008.